Ladies and gentlemen I was shocked when I heard about the killing of rap artist Nipsey Hussle. He was killed in Los Angles in front of one of his businesses. Nipsey was only 33 years old. His killing has shook up Los Angeles and shook up the music world big time and this is no joke. I don’t give a damn if he was a member of a gang. I can care less! Nipsey Hussle was a talented young brotha. Period. And I am hurt as a human being. Hussle was to meet with L.A. police Chief Michel Moore about ways he could help stop gang violence and help young kids in the community. His killing has many folks going on social media to talk about the killing of Nipsey Hussle. Cardi B wrote “May the Lord give your family strength. You can’t kill love and you can’t kill respect.” That was just one of many thoughts about the senseless killing. 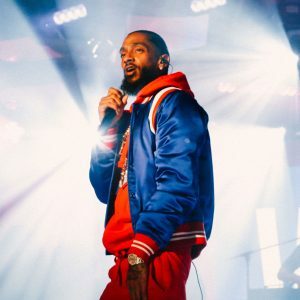 The story is Nipsey died after being shot in the head and torso in the parking lot of “The Marathon Clothing “smartstore” he owned near the corner of Slauson and Crenshaw in Los Angeles. Like I said Hussle was a performer and a businessman. Also Nipsey had a mixtape that was released in 2013 called “Crenshaw,” and priced it at a whopping $100 a pop. The great Jay Z picked up 100 of the 1,000 available copies. That was big ladies and gentlemen for Nipsey. “Victory Lap” earned him a Grammy nomination for best rap album. By the way the Grammy went to Cardi B. Nipsey has a thick catalog of music which he released on mixtapes independently or though his All Money In record label. 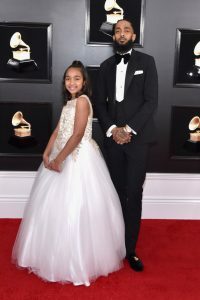 I want to include in this article that Nipsey Hussle was a father as well as a music artist and businessman readers. He has a son Kross with actor and longtime girlfriend Lauren London and a daughter Emani from a previous relationship. He was a Eritrean-American rap artist/businessman and his real is Ermias Davidson Asghedom. On the business side he started his record label plus The Marathon Clothing store. Plus he started Marathon Agency, a talent and marketing company and his Proud 2 Pay campaign, a trailblazing way to distribute music. All this by the age of 33. In 2010, Nipsey took a leap into social media. He had millions of followers. In 2013 he said he wanted to upend a system which controlling record labels acted as “gatekeepers” for young minds trying to make names for themselves. Let’s keep it real folks, Nipsey Hussle cared about his community and he wanted to help stop the violence on Los Angeles. Check this out ladies and gentlemen, Nipsey opened a work space and science, technology, engineering and mathematics, or STEM, center that he said was a bridge between Silicon Valley and the inner city. He told the L.A. Times that he wanted the center that was named “Vector 90, would give young people more options and opportunities than he had as a kid. “Music Inner City News Magazine” readers, word is Nipsey Hussle loved his community. He bought shoes for students, he fixed playgrounds and basketball courts. He helped to fix up a old roller rink. He provided employment and shelter for homeless residents. He paid for funerals for residents who could not afford them PLUS he invested in “Destination Crenshaw” which is a art and culture project that celebrates Los Angeles black history. You want more about the late Nipsey? His clothing store was part of a strip mall renovation that would have apartments for low income families. L.A. County supervisor Mark Ridley-Thomas called Nipsey an “inspiration to many.” Atlantic Records called him a amazing father and a community leader. Actor Issa Eae said he inspired her to invest and own in the community. I can go on and on about the late Nipsey Hussle. But here is a few more stories for. A popular burger joint in Nipsey Hussle’s South L.A. neighborhood had high top tables but no chairs. Nipsey thought the owner of the business wanted folks to order their food and then leave. Without chairs, folks could not loiter. Nipsey told a music blog Genius recently “I remember that, being young feeling like how dare you. So guess what readers? NIPSEY BOUGHT THE BUILDING!! Hussle then told the music blog Genius “Now he’s our tenant. He pays us rent every month.” The burger joint now has chairs.” This story shows how that Nipsey Hussle cared for black and Latino people in Hyde Park in L.A. And Hussle had a plan to “buy back the hood.” And recently he was on his way before he was gunned down at the young age of 33. And in January, Hussle and real estate investor David Gross bought an L shaped shopping center off Slauson Ave in L.A. The corner that has Master Burger and Hussle’s store, The Marathon Clothing for $2.5 million. Hussle and Gross had plans to buy more properties. Now that dream of Nipsey will not happen because he was gunned down in front of the business he owned in Hyde Park. Sad readers. Gross has said he and Nipsey had plans beyond the South L.A. area. They wanted to create a private equity real estate fund using Opportunity Zone tax incentives, created as part of the Tax Cuts and Jobs Act of 2017 to encourage long term investment in low income urban areas. In a recent interview with Forbes, Hussle laid out plans to use the tax incentives to put his Marathan Clothing stores, barbershops and fish markets in cities across the United States. One thing for sure in a hip-hop business that shows a lot of flashy cars and jewelry in many of the videos I play on “Music Inner City TV”, Nipsey Hussle was slowly but surely turning his street hustle into making him a flat out businessman. And a man who loved to help people and help his community. 33 years old is to young to die. I am hurt by the killing of Nipsey Hussle. As far as I know, my media was the only locally produced television show or radio station that played Nipsey’s music from the Seattle/Tacoma area. I am almost sure this is the case readers. RIP to Nipsey Hussle and I wish the best for his lady and his kids. One thing for sure ladies and gentlemen..WE HAVE TO STOP THE VIOLENCE AND INCREASE THE PEACE!! TOO MANY YOUNG BLACK MEN ARE DYING IN THE STREETS!! Is There Racism Going On With Red Carpet Coverage Of L.A. Events?